Father’s Day gives us a reason to celebrate our Dads, either in life or in memory. I think of my father, Leonard, every day during a 15 minute prayer ritual I do. He used to do the same routine and I adopted it when I was 13. It’s one of many things I observed and copied. At one point I take note of people who were important to me and I briefly imagine them. My memory of my father always comes up first. He was a dominating figure to me as I was maturing. He would tell stories about growing up that mesmerized me because he recounted both the tough times and the happy ones. His mother was a psychological mess, often ending up in mental institutions where she received shock treatments, the therapy of the day before antipsychotic drugs. His father told him that they day he married Ethel Levinson was the worst one of his life. Divorce was out of the question back then, so they stayed together and had five kids. One died as a young child so my father was the youngest. He sought refuge at the Pinkert house nearby, where he had the benefit of 11 first cousins to hang out with. It was a happy second family for him. Leonard’s Dad was his role model. He loved him deeply and cherished the rides in his truck while calling on his scrap metal clients. My father graduated from the University of Chicago in 1938. There were not many jobs available then. Proctor and Gamble was hiring and he applied but didn’t get a sales position, so he joined his father Louis in the scrap iron business. My father had one stipulation in his employment. He would not drive the truck. For a couple years together the business grew as my father found the profitable niche of scrapping failing ice cream factories that had valuable copper in their freezers. Sadly, Louis died at 51 in 1941 of a heart attack. My father was devastated but went into business with his uncle Abe and took on the management of his mother’s emotional health. In those days men and women married young. My father was long, lean and handsome at 6’6” tall. A chance introduction to 19-year-old Thais Kassel who lived in a high rise elevator building on the north side of Chicago led to a whirlwind romance and marriage. While Thais’ father may have wanted a son-in-law with a better pedigree than son of a scrap dealer, Leonard was not a man to be denied the woman he had fallen in love with. My mother dropped out of college to become a homemaker and have children. Children didn’t come for 3.5 years, which had people cackling, but I was born in December of 1944 and my sister Susan 13 months later. The back to back pregnancies left my mother with post-partum depression and her mother moved in to take care of the kids while my Mom convalesced and my father was busy building his business. My parents told me I did not talk until I was three years old, which could have been a reaction to the absence of my mother. As I grew up my Dad was a major presence in my life. He dominated the dinner meal with stories about his business which had become buying and selling used machinery in the mid 1950s. He made the business competition sound like sports and I ate up every story. He taught me to play tennis (his preferred sport) and put up a basketball hoop in our backyard. He hit me fly balls to catch in the park across the street and made the house a safe haven for his wife and three children. There was no discernable conflict in the house because my father did not want any and would not allow it. He was lord of his castle. Nobody thought to challenge him on anything. The Graff house was a peaceful enclave for him, the opposite of what he grew up in. He was determined that his family would be free of turmoil, yet he visited his mother almost every day and brought her to our house every Friday night and Sunday. She knew how to press his buttons and manipulate him emotionally like no other person. On trips I would observe him talking to her in a phone booth and then watch him leave the booth in emotional pain. He could control most things, but not his relationship with her. I joined my father in the machinery business in 1970 and my brother Jim joined soon after. I think it gave him pleasure, but he would have been ok with it continuing like it had, too. He never put any pressure on me to join him. I watched as his health eroded with heart problems, diabetes and almost constant migraines. He took off more and more time, but he always was tuned into the business. His old partner Aaron Pinkert retired but my Dad persevered though Jim and I continued to grow our roles. My mother died several years before my Dad died. They were married more than 50 years and he felt much loneliness and some regret that he was not as available emotionally to her as she needed. 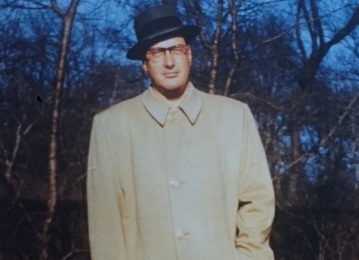 But on Father’s Day (and a little before) I remember him as a Dad who loved his family, was committed to his business, and struggled mightily to move past the turmoil of his childhood. I loved him deeply. Question: What’s a story about your father you have never told anyone? Thanks for sharing your story Lloyd. Very moving, and gives great insight into the generations that preceded us. Enjoyed hearing about your Dad and your family life growing up Lloyd! My Dad passed a little over 2 years ago, so still dealing with the angst of it all. As the saying goes, be grateful for what you have for it all can be gone in an instant!!! Well written and it reminded me, in part, of my fathers life journey. Thank you Lloyd, This article as well as your others are always pleasant to read. It is very nice to hear stories that you can relate to and zone out for short time period while making the donuts every day.